As a French girl blogging about clean food recipes I MUST share an healthier version of my favorite french crepes recipe. Plus, mum visit me in new Zealand right now – she is coming from France, she is diabetic and those almond flour crepes are a great gift for mum: a 100% diabetes friendly recipe. She can finally enjoy some french crepes that will not raise her sugar level too much. My mum always had many different French crepe recipe for us as a kid. She loves to makes buckwheat crepes with savory filling and wheat flour crepes for the sweet fillings. Today I want to surprise her with a new french crepe recipe using only almond flour. Vanilla – vanilla essence or vanilla paste, check the ingredients list some contains sugar! I discovered this recipe in a cookbook two years ago and I adapted the recipe until it reach the texture of a classic french crepe as you could eat in Paris – minus the extra carbs! My almond flour crepes are 100% dairy free. I know many people add cream cheese in their almond flour crepes, but I don’t. I am French, crepes are French and this almond flour crepe recipe is most closer in taste and texture to the authentic French crepe recipe. Yes! the dairy free French crepes recipe made with water instead of milk are thin, light and crispy with a light egg flavor. Those almond flour crepes are made to be filled with sweet fillings or they may be slightly tasteless on their own. I recommend many different low carb crepes filling below. Choose the one you like the most depending on the time of the day you make the crepes. For dessert I love whipped coconut cream and berries but for breakfast I prefer sugar free nutella or nut butter. Whipped coconut cream filling sweetened with swerve – a natural sweetener similar to stevia. In the picture above I also cooked some plums in water with ginger, cinnamon and vanilla. Spicy water is a great way to poached fruits without sugar. As I am a coconut lover I sprinkle lots of desiccated coconut on my crepe plus fresh mint. It is very optional but I highly recommend it for a tasty fancy low carb dessert! Plums are not very low carb though so for mum I used grapefruits. Erythritol, ground cinnamon and coconut – simple but always a delicious combo. Those almond flour crepes are very simple to make so don’t be afraid to try this recipe even if you are not a chef! It is a NO FAIL recipe for sure. Whatever you have a crepe pan or not, if your pan is hot enough the batter will spread evenly and cook beautifully. Only 2-3 minutes on both sides and they are ready to eat. You will love the delicious crispiness of the borders. The texture is light,crispy and perfect to make a dessert or a sweet breakfast. 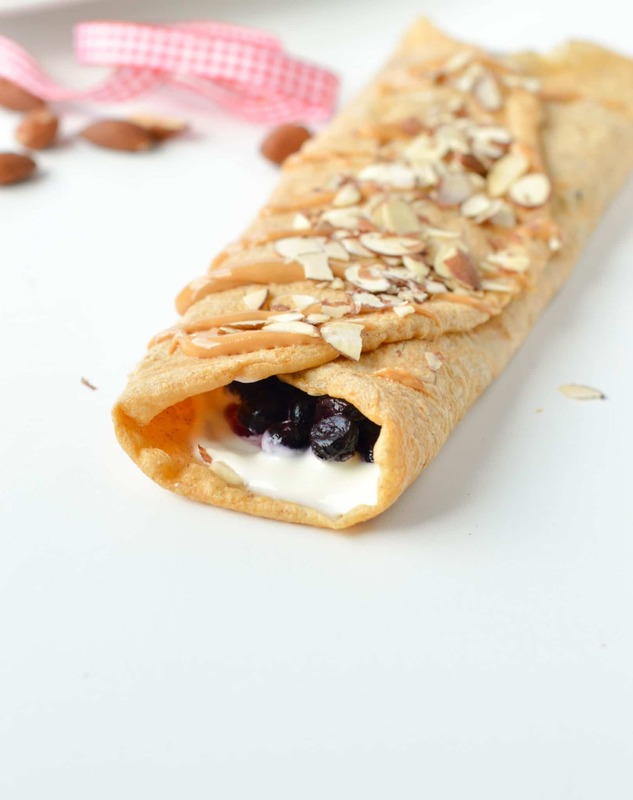 Watch the recipe video and make those simple almond flour crepes now ! Those Almond Flour Crepes contains only 3.8 g net carbs per crepes. Easy 4 ingredients recipes with eggs, almond flour, coconut oil and cinnamon. Best Low carb dairy free crepes. Gluten free, paleo and sugar free too. Those almond flour crepes are crispy, light and a delicious low carb breakfast crepes. 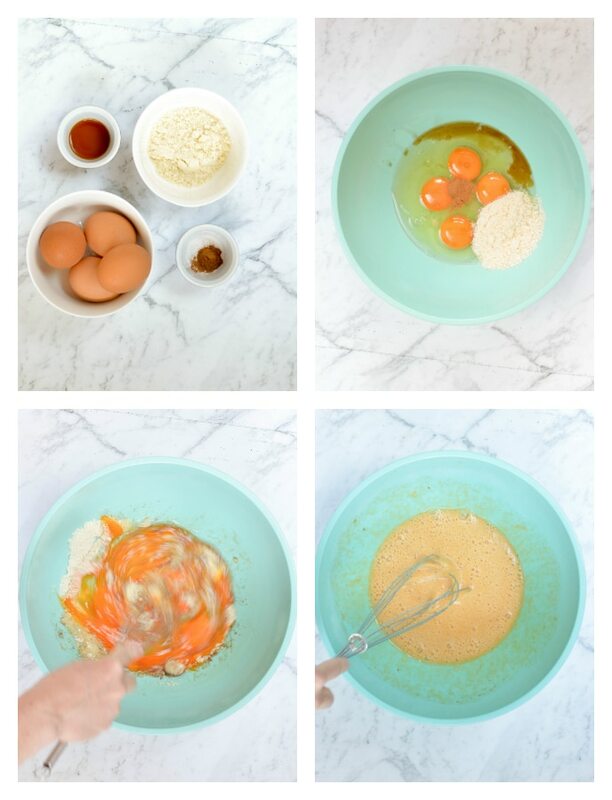 In a medium bowl whisk the eggs, ground almond, vanilla extract and ground cinnamon until combined and no lumps forms. Set aside. Warm a crepe pan of 9 inches diameter (25 cm), under medium heat, and use an absorbent paper to rub the coconut oil on the pan and grease the pan. Scoop the crepe batter into the frying pan and tilt the pan with a circular motion to ensure that the batter coats the surface evenly. The thickness of the crepes will depend on how much batter you use for each. Usually 1/4 cup is what you need to make a 10 inches (26 cm) crepe. Cook the crepe until the sides start to crisp up and lift off easily from the frying pan. It should take about 2 minutes each, over medium heat. Loosen with a spatula and flip over to cook the other side. Both sides should be lightly brown, and the crepes should be crispy on the sides and softer in the middle. Repeat for the next crepes. To serve fill each crepes with the whipped coconut cream, fold in a triangle and top with the fruits of your choice fresh berries, spicy plum jam etc. Storage: The crepes, unfilled can be stored in a fridge, on a plate. Make sure you cover the plate with plastic wrap to avoid the crepes to dry out. Can be store up to 3 days. Rewarm on a crepe pan and fill with filling of your choice. Low carb sweet filling ideas: whipped coconut cream sweetened with stevia, berries, sugar free jam, yogurt, sugar free melted chocolate, desiccated coconut, unsweetened cocoa powder, nut butter (almond, cashew, peanut), seed butter or even coconut butter. Savory filling: those crepes makes a delicious savory meal as well. Simply don't add the vanilla and cinnamon in the batter, add 1/4 teaspoon salt instead. 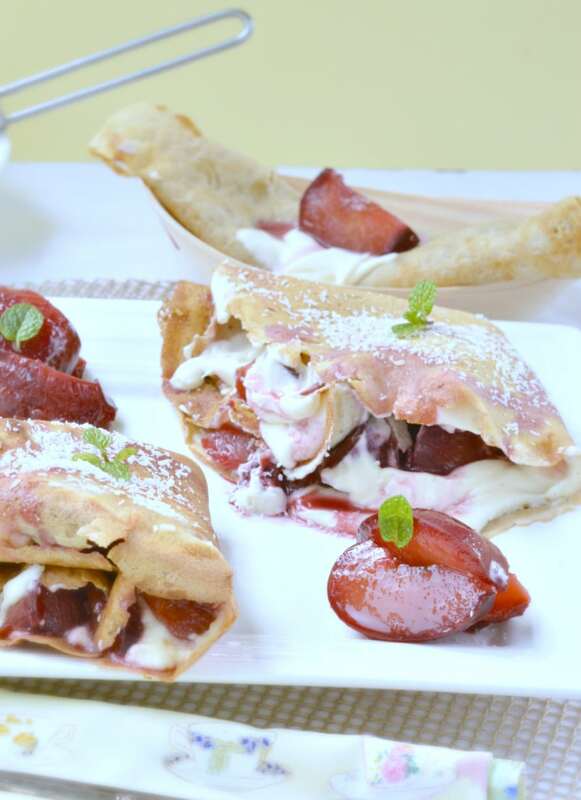 After you cook the almond flour crepes, bring back to the pan, add a handful of grated cheese, some ham/bacon, grilled vegetables, fold the crepes in half and return to eat in the pan for few minutes until the cheese is melted. Favorite combo are cheddar + bacon + fried onion or cream cheese, spinach and ham. 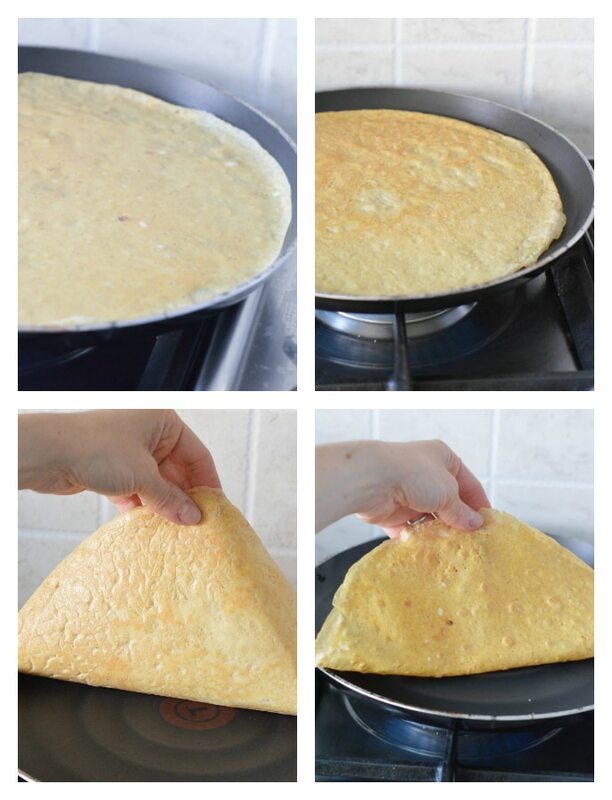 Crepes pan: I used a 9 inches Tefal crepe pan with non stick coating. I can eat crepes all the time. I can have them for dinner or dessert. I am intrigued by these almond crepes. Looks delicious! Hi Ilona, You should try this recipe it is very surprising! Enjoy. Carine. I don’t have a crepe pan but it works very well. It is a good crepe to stuff with peanut butter and berries. I used the crepe recipe this evening for our Shrove Tuesday pancakes. Added a tablespoon of melted butter to the uncooked batter to enrich it, filled the crepes with summer berries and lightly-whipped double (heavy) cream and they were delicious. My non-keto, non-low carb family agreed. Hi my friend, Thanks for your lovely comment. I am so happy to read that your family loves this low carb crepe recipe. It is great to have low carb recipe that everyone can enjoy without noticing the difference. Keep browsing the blog I have got lots of low carb/keto recipe available ! Thanks for reading my blog and testing my recipe. See you soon around. xoxo Carine. Just noticed that you didn’t use my screen name. Could you please amend your post? Can’t wait to try these! Sounds Yummy! These were so delicious. I was craving crepes so badly and this recipe truly satisfied without the guilt! Thank you so much for this lovely comment! I am so glad you enjoy those crepes. It is so hard to fix a craving when you are on low carb diet! Those low carb crepes are definitely the best I made for this occasion. I am so happy that the recipe help others to fix their cravings ! Enjoy the low carb recipes on the blog. xoxo Carine. So quick and easy. Thanks for the recipe. I halved it and it was perfect serving for 1. Thanks for this positive comment! I am so happy that you love those low carb crepes, my family always loves it too even the kids ! Enjoy the recipe on the blog, XOXO, Carine. I made them many times, it is a very yummy low carb crepes that I love to eat with melted cheese too – I just don’t use vanilla and cinnamon in the batter. Please clarify. You mention water in the blog post: “Yes! the dairy free French crepes recipe made with water instead of milk are thin, light and crispy with a light egg flavor.” Do you use water then (not shown in actual recipe)? Also, do you really use almond meal or almond flour? The meal seems like it would be nuttier and thicker than almond flour. Please advise. Thank you for your time. Hi! I did not add water or milk in this low carb crepes recipe, follow the recipe and it will perfectly work. In my blog post I am talking about the high carb authentic Frech recipe, the one I was born with, the one that inspire me to create a low carb version (this almond flour recipe) which has a similar texture without the bad carbs. You can use whatever you like almond meal/ground almond/almond flour all are exactly the same thing. The only difference you can sometimes spot in store is darker almond meal that use unblanched almonds (the one with skin on). But any almond meal works here even superfine one. Enjoy the recipe and merry Christmas. XOXO Carine. Thanks for sharing your savory recipe ! I always eat my crepes sweet but I LOVE your idea! Delicious combo. Thanks for taking a minute to share this here. I hope you will find even more delicious recipes to try on the blog. XOXO Carine. So easy and delirious, I will try sweet and savory fillings, great for bread replacement! Thanks my friend! I love to read positive feedback like this. Enjoy the crepes. XOXO Carine. Is this able to be make with egg substitutes eother liquid or powder? Not this one I am sorry. There is 4 eggs in this crepe recipe so it won’t work with a egg replacer. 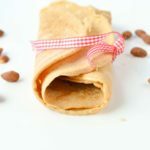 Try my buckwheat flour crepes recipe or 2-ingredients chickpea flour crepes recipe, both are egg free and gluten free. Enjoy ! XOXO Carine. Thank you so much for sharing this recipe! They are so simple and taste fantastic. I made a “carrot cake” version by adding two finely grated carrots to the batter and increasing the cinnamon. I filled them with a cream cheese filling I sweetened with my stevia blend. I am really excited to try these again with your sugar free Nutella! My pleasure! thanks SO much for taking a minte to share such a beautiful comment. I love your carrot idea! Sounds delicious. See you soon on the blog. XOXO Carine. These are so good! I had them for breakfast and I have enough left over for lunch with some shredded pork. I’m so happy you made this recipe. I have missed crepes so much. Hello! I am so happy to read your beautiful comment! I can’t live without crepes either 🙂 Probably my French roots ! I also recently made coconut flour crepes, low carb too and very tasty if you want a different crepes recipe for some other days. It is here. Enjoy the crepes and the low carb recipes on the blog. XOXO Carine. I just made these. They are perfection. I made them 1/2 size and filled my first 2 with almond butter and cherry almond butter. So so so good. And the recipe could not be easier. I already have it memorized. This is a new staple in my meal/snack plan! Thanks for this lovely comment ! I am so happy you enjoy the almond crepes. Enjoy them and the other low carb recipes on the blog. XOXO Carine. Thank you for this recipe. I am looking forward to trying it. Is it possible to freeze them? I like making things that can be frozen and reheated later. I won’t freeze any sort of crepes. I tried before and I don’t really like the result. However this is a quick recipe that keep well in the fridge for 3-4 days ! Enjoy the crepes! Carine. Hello! It is a low car recipe mainly made of eggs so yes the egg texture is there for sure! If you prefer a different low carb crepe recipe try my coconut flour crepes recipe. It is delicious too and you would probably prefer the texture if you are not very much into egg crepes. Enjoy the blog recipes my friend. XOXO Carine. This recipe is delicious. I’ve been put on a tough diet of no dairy, grains or sugar so this recipe is ideal. I did eliminate the vanilla but filling the crepe with banana and a fruit compote. Thank you for this recipe!! My pleasure! It makes me so happy to share recipes that can help anyone on a diet! I know how difficult it could be to find tasty recipes without this or that. My husband is dairy free, egg free and meat free and I don’t eat sugar! So my daily challenge is to create easy tasty recipes that are allergy friendly and share them here. Enjoy the recipes on the blog <3 XOXO Carine. I just had these for lunch. I omitted the vanilla as I wanted to fill them with chicken, cheese and roasted red pepper. They were AMAZING!!! Thank you for this delicious recipe. It will be a staple in my diet! Great ! I love the savory filling ideas. Thanks for sharing. Enjoy the blog and all the low carb recipes around. XOXO Carine. Is one crepe 3.8g or 4.6g? I guess you are asking about carbs amount per crepes. One crepe contains 4.6 g of carbs but only 3.8 g net carbs. Net carbs is what is important on a low cab diet. It is the amount of carbs in a product minus the fibre that are not assimilated by your body – so they don’t count as ‘carbs’. I hope it makes it clearer. Enjoy the almond flour crepes. XOXO Carine. These were delicious! Thank you for sharing such an easy recipe. I added the tiniest bit of coconut flour, and filled them with coconut cream + fresh fruit + powdered hazelnut spread and I felt like I was indulging in such a decadent breakfast… all while keeping it low carb. Merci beaucoup! Merci pour ce joli commentaire! I am so glad you enjoyed the crepes. Lovely filling too. Enjoy the blog. XOXO Carine. Ravie d’avoir trouver votre ” blog” ! I bought the almond flour some time ago and was wondering what to do with it . Crepes are my ultimate favorite treat ! Will try them today . Merci ! C’est vraiment gentil! Contente d’avoir plus de francais qui me lise aussi. Those crepes a re slightly different to the original French crepe recipes – more ‘eggy’ texture as it is a low carb recipe I don’t use flour here. I hope you enjoy this little twist on our original french recipe. A bientot et merci de me lire ! XOXO Carine. Hi Carrie! If you are looking for a crepes/pancakes recipes that is low carb and doesn’t taste too eggy try my coconut flour flatbread. Those are 100% egg free, low carb and low sodium. They are soft and delicious with any sweet or savory filling. You can roll them thin or thicker like a pancake if you prefer. Recipe is HERE. Enjoy the low carb recipes on the blog. XOXO Carine. Delicious! And easy to make! Thanks for this lovely comment! I am so happy you loved the crepes 🙂 Enjoy the low carb recipes on the blog. XOXO Carine. My son is new to the low carb world. We have been trying to find a pancake recipe he likes. Well I like crepes so I through this out there. Made these tonight minus the cinnamon. Filled with homemade peach jam and some sweetened cream cheese. My kid ate 3. He proclaimed they taste like ones made with regular flour. I now have a new crepe recipe! Thank you!!! That is the BEST comment ever! I am a mum too so it makes me so happy when I read that others kids than mne enjoy my low carb treats ! Trust me all the recipe on my blog has been tested by my 2 picky eaters so you are in the best place if you are looking for family friendly low carb recipes ! Enjoy the blog and crepes! XOXO Carine. This is a low carb crepe recipe. It doesn’t intend to be or taste like a french crepe at 100%. It is an alternative for diabetic or people eating low carb/keto diet and can’t have wheat flour. If you like thinner crepes, you can simply add a bit more milk in this recipe and spread this thinner on the pan. Enjoy the blog. Carine. p.s. je viens de trouver ta recette pour les crêpes français aussi et j’ai hate de l’essayer. D’habitude je mets un oeuf de moins que la recette, et je n’ai mis jamais du sucre ou vanille dans les miennes. Si le mari l’aime, ce sera ma go-to recette! Super! Enjoy the crepe recipe. A bientot sur le blog. Carine. Don’t mean to be negative but these are very eggy. Saying that these are close in taste to an authentic French crepe feels like false advertising. The texture does feel similar but it very much tastes like a bland omelette. Which is fine, but not disappointing when one is looking forward to something that tastes remotely like a crepe. Thank you for sharing your recipe, but I would encourage you to remove any text stating that it tastes like a crepe. As I replied to you personally this morning, this recipe has been developed to provide a tasty low carb and keto crepe option to people who can’t eat carbs or white flour. That is the closest to French crepes you can make on keto diet and that is the purpose of this recipe. My blog provides mostly recipe for low carb diet so yes it taste slightly different to regular recipe, and if you want the more conventional recipe I also have it on the blog. Look at the real french crepes recipe here, the one mum teach me as a kid. Enjoy the blog recipes XOXO Carine. This recipe is legit! I didn’t have any almond flour on hand, so I substituted about 1.5 tbsp of coconut flour (I started with 1 tbsp and played around with the .5 until it seemed like a good crepe consistency) and it was delish!!! Thank you for the lovely feedback. I am very happy to read that this simpl almond flour crepe recipe works with some coconut flour too! Thanks again for trying my recipes and taking a minte to share such a beautiful experience. XOXO Carine. 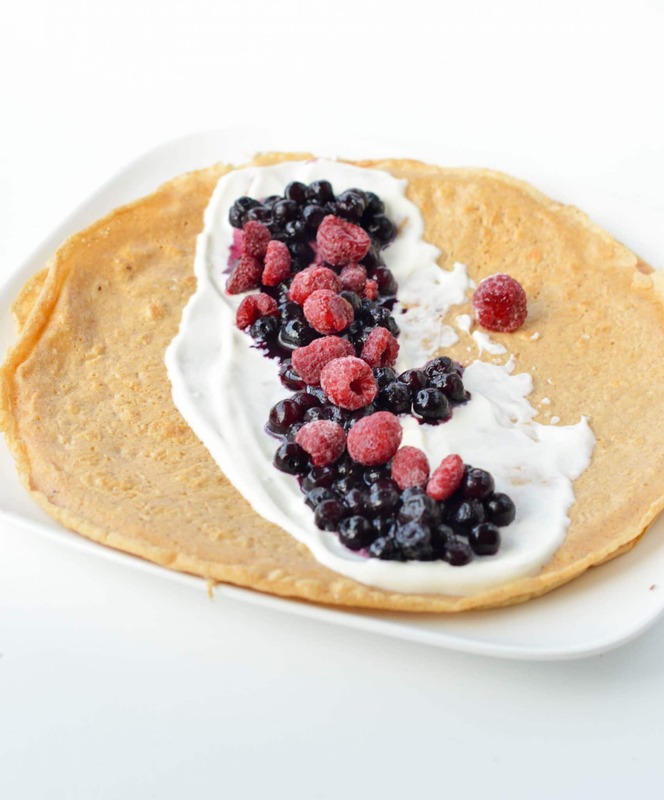 I have a low carb pancake recipe I love that calls for cottage cheese. It calls for eggs but I use egg beaters to reduce the cholesterol. Any idea how these would turn out with egg beaters? Essentially egg white only? I guess it should work pretty well as soon as you use as much egg beaters as the volume of eggs recommended in this crepe recipe (to keep the ratio right)! Let me know if you give this a go. Enjoy the recipe. XOXO Carine. I have been after a good low carb crepe recipe ever since I started keto and this one is perfect! I made these this morning. I did two savory & two sweet. My savory ones were a mozzarella cheese, sautéed tomato and onion filling & my sweet ones were a keto strawberry jam with melted drizzled chocolate over them & also topped them with my homemade whipped cream! Delicious! Love this recipe! You are very welcome! Thank you for posting this recipe! I cant wait to try out more different types of fillings!!! You are very nice! I am so happy to have you here. Have a lovely time on the blog. XOXO Carine. That sounds delicious ! Thanks so much for sharing this and trying my recipes. Enjoy the blog recipes. XOXO Carine. Thank you for the lovely feeback! I am so glad you love those crepes. XOXO Carine. I think your crepe has even less carb than what you calculated. The only source of carb is the almond meal, and it only has 5 grams. so if you make 4 servings out of that, then you’d end up with 1.25 g of carbs. That is probably true! I only post the nutrition value as indicative numbers, then I always recommend everyone to enter the exact brands of each ingredients they use in their own nutrition tracker. It can vary a lot from brand to brand. Thanks for the lovely input ! Enjoy the crepes and all the low carb recipes on the blog. XOXO Carine. Was not a fan of this recipe, ended up making crispy grainy textured omelets. Made the french crepe and the almond flour crepe on Saturday to compare. Loved them both! The almond flour crepe has a little egg flavor but does make a great savory palette for eggs, avocado, cheeses and meats like bacon or pulled pork. It seems that the main difference between the almond crepe and the original french crepe is the addition of milk as both recipes have four eggs. Do you have a recipe for or how would you add almond milk to the almond flour recipe to more closely mimic the flavor of the french crepe? How much almond flour to how much almond milk? Thank you so much for trying 2 recipes from my blog that makes me so happy! 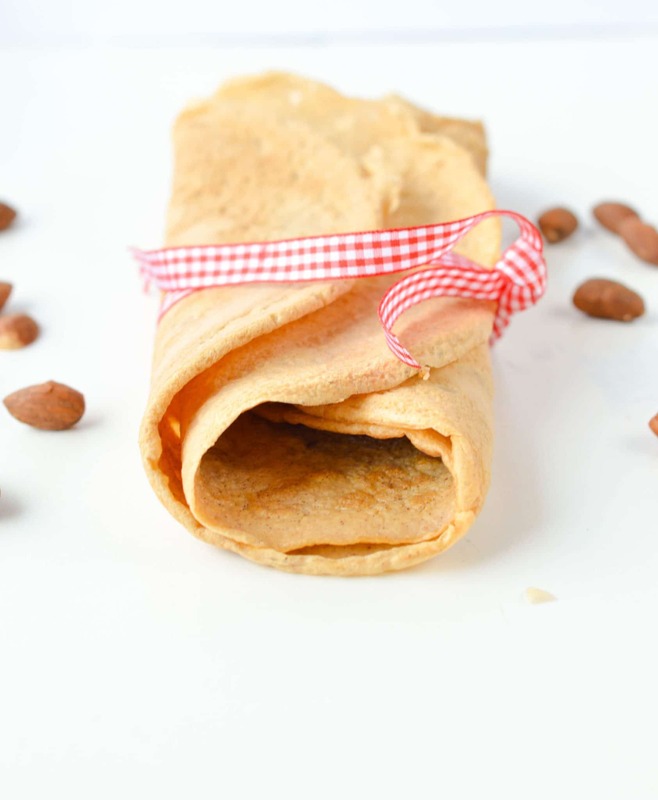 The almond flour crepes recipe intend to be low carb that is why it is a bit more egg in texture, less low carb flour so I totally agree with you with the savory filling. My tips to use the almond flour as a sweet base is to add natural sweetener in the batter like stevia, erythritol or coconut sugar if you are not on a sugar free diet. Others great sugar free healthy spices that boost their sweet flavor are ground cinnamon and more vanilla. You can definitely use vanilla almond milk too in this recipe. Finally I recommend to try the coconut flour crepes or buckwheat crepes recipe on the blog. Those two are also amazing if you are a crepe lover like me. Enjoy the recipes on the blog. XOXO Carine. The recipe works and make crepes! They are true to the description and not sweet, a little bland, and eggy. But, they were a great canvas for other toppings and best of all, they were gluten-free! Thank you so much for this beautiful feedback an for trying the recipes on my blog. XOXO Carine. Tried the crepes this morning with a quarter tsp of salt so that I would have them with savory fillings. Perfect! Filling, going with the french theme – french onions and cheese. Thanks for the recipe – mynew go to for weekend brunch. That is amazing ! thanks for the lovely feedback and for trying my recipes. XOXO Carine. Man these hit the spot!!! Easy and delicious! Us low-carbers are always looking for a vehicle for yummy fixings and this is it! I’ll make savory versions in the future for sure. On Cronometer the net carb count for these was even lower than stated so that’s a bonus too! Thank you again and I look forward to checking out the rest of your blog. OMG! your pecan butter recipe sounds amazing! I will definitely try to make some for my next crepes. Thanks for sharing and thank you for the lovely feedback on those crepes. I love living a low carb lifestyle and enjoy some treat so here you will find lots of them 🙂 Enjoy the low carb recipes on the blog. XOXO Carine. Could these be made with egg beaters? yes sure! but don’t over beat the batter or it will add air. Enjoy the low carb recipes on the blog. XOXO Carine.